In 1924 an existing orange grove property, in the town of Mentone, was split and Walter M. McIntosh erected a lovely fieldstone house in 1925. This home’s exterior, which is stuccoed on the interior, is in the Craftsman style and completely made from large irregular river rocks, or fieldstones, with wood trim around the window and door openings. Originating in southern California, the Craftsman style quickly spread throughout the country by pattern books and popular magazines but faded after the mid 1920s. To this day, the 1.88-acre property lies on the south side of Mentone Boulevard in the unincorporated area of San Bernardino County. Apparently, Mr. McIntosh never resided here because the house and property were leased to Jessie M. Savage the first two years for cultivating oranges. In 1927 Mr. Savage purchased the property and remained until 1939. An asymmetrical small cross gable in the front with a partial-width front porch bisects the low-pitched side-gabled roof with exposed rafter tails. In the back a larger cross gable finishes the 1,300 square feet of living space contained on a single floor. The stone exterior chimney with symmetrical adjoining windows is prevalent for the Craftsman. All the casement windows, plus the front door, have an interesting decorative geometric detailing in wood. This creates small square lights in each corner and elongated narrow lights on all four sides of each window. 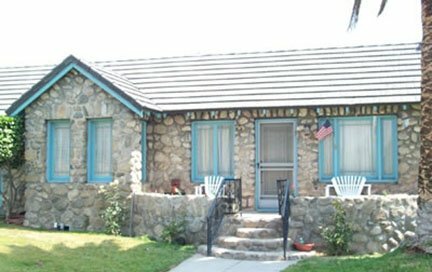 The detached garage, to the southwest side of the property, is completely made of fieldstones as well.In 1939 this became the property of Frederick S. and Josephine Helen Paine. From 1955 C. W. and Essie R. Royce owned the property until they sold it to Judith Marie Anderson in 1962. It was during her ownership period, on December 6, 1966, that the current owners, Richard and Donna Rozema purchased two separate adjoining orange grove properties. This piece of property changed hands one more time, in 1977, when it was purchased by Kenneth D. and Kathleen M. Cooper before the Rozema’s purchased this house to accompany their existing grove property in 2001. Today the Rozema’s sell produce, including oranges, avocados, and tangerines, from a roadside stand in front of this adorable Craftsman. The Redlands Area Historical Society congratulates the Rozema’s for continuing to maintain the authenticity of this charming historical fieldstone home.